Our tramps are both failing, so time to get replacements. I was originally sticker shocked when I saw some sites charging $4k for new tramps for my P435. Then I've since found some much more attractive options ranging from $1k-$3k. We are going with something that's more netting based (or less coverage) since we take her out into the ocean quite a bit. Better to let the water pass through when upwind as far as we understand. Here's my problem: why would I spend so much money on essentially a net? Can't I just do some heavy duty fish netting for like, $200? Reddit told us, essentially, "Why mess up your $300k boat and not spend $3k on netting". But I'm thinking, "I have a $300k boat because I don't spend $3k on a net..."
Anyone have any updated experiences? we got our replacement from Sunrise in Florida for around 1,800 and it is probably quite a bit bigger than yours. We chose the offshore web for the same reasons that you are citing, and it has served us extremely well in the last 4 years. I used Sunrise for my 435. The Offshore Nets were perfect when they arrived and, after my post in the original thread, they went on and survived a circumnavigation and were still in great shape. I replaced mine last year and also went with nets from Sunrise Yacht Products out of Florida (https://www.multihullnets.com/Produc...HMeshNets.aspx). (I probably got the recommendation from Mike). They already have the template for the Privilege 435 and interestingly enough, they have the three or four different hole pattern templates for the 435! I went with the mesh similar to below. It cost me $1,200 for the pair. Another vote for Sunrise. 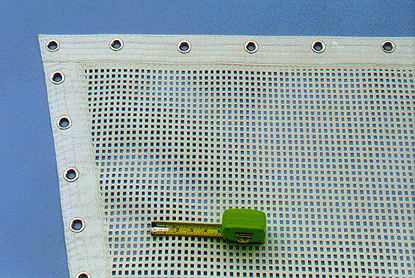 I installed one in 2008 - "offshore mesh" - and it's still going strong. I'm watching closely now for the first sign of it's end of life, when I have every intention of replacing it with another, identical one. Related, I chose grommets for attachment and simple lacing with 1/4 inch StaSet for lacing. No regrets. The hard part is stretching the net out for installation. Using the cockpit winches to stretch it out at the four corners worked well for me. See pics. You are right to think that you do not have to spend 4k on nets. Our nets are 9'x9' each. The original nets were heavy duty woven polyester with a UV coating that we got from West Coast Nets for about $150. They were still looking good 6 years later when we replaced them with dyneema nets from Netsystems for $1200. The main reason we went with the dyneema was for comfort as the original nets had a 1.5" mesh and the new ones have 7/8" mesh. The polyester nets were plenty strong, just not as comfortable. Not quite correct. Proper knotless fishing net 25, 32 and 50mm squares, is obtainable very cheaply less than $200 for enough to do several tramps. You need to find a wholesale rope gungy or commercial fishing supplier, willing to sell offcuts or "cod ends", "trawl ends". These are usually black. Be sure it is braided polyethylene (not twisted or polypropylene) this is almost entirely unaffected by UV. I have used it on several boats and it always replaced because of wear or chafe rather than UV. I use polyethylene irrigation pipe around the edges. The longest I have used it as a tramp is 9 years and this is in the tropics. I have a triangular knotted piece to give access to my bow sprit that is from 1994 (so 22 years). It is not as comfortable as the more expensive netting. I got my netting from here: http://www.haverford.com.au/catamaran_netting.html Less than $200. Another vote for Sunrise. I have the Offshore 3/8in. Polyester Open Net, cost $1500 in 2012. Well into our second season in the caribbean and it still looks good, ok to lie on etc. And they remain in great shape. Thanks for the wealth of responses everyone! Really appreciate all of the feedback. I *think* that I'm going to try to find myself a knotless net by the foot and add a perimeter line. I'm hoping to save some $$ to invest in a lot of other things the boat needs (including the new sales this year). I will try to remember to report back with how I make out! ...I've just ordered a new set of sails for my 435. They have been shipped and I'll have them later this week. I already have a new screecher and went with a new main, genny and asym spinnaker. Getting her ready for my circumnavigation within the next couple of years. Awesome! We're doing new sails this year too. Just the jib and the main. The screecher is still in pretty good shape as far as I can tell.